Derbent, in Dagestan, is one of the oldest and most beautiful cities in the Russian Federation. The precise date of its foundation is lost in history, as the saying goes, but after surviving numerous attempts at its destruction, it still preserves much of its ancient character. Not many cities in the world can boast such a rich historical and architectural heritage. The jewel in Derbent’s crown is the Naryn-Kala citadel, a magnificent stone complex built on a difficult site on a steep slope; and the symbol of the power of the rulers who lived in it. The role of the city’s peoples in the development of global civilisation was recognised in 2003 when its historic buildings were designated a UNESCO World Heritage Site, recognition which has enhanced its chances of being able to fund the conservation and restoration programme essential for the further survival of its ancient monuments. And it was recognised again by UNESCO in 2006 for its long record of religious tolerance, a city where Jews, Muslims, and Christians lived together in peace and co-operation. View of Debent Naryn-Kala castle from the cemetery. CC Oleg Moro. Today, Derbent is a fast-growing modern city with enormous tourism potential, thanks to the combination of its cultural heritage and its situation on the western coast of the Caspian Sea. But its attempt to commemorate its long history has been mired in official procrastination and infighting. The idea of celebrating the 5000th anniversary of Derbent’s foundation arose at the start of the 2000s and, once the city was awarded UNESCO World Heritage status, the city council began to discuss how best to mark the occasion. The idea was given official support by then President Dmitry Medvedev during a visit to Dagestan in August 2010, and by the end of that year the newly-elected mayor Imam Yaraliyev announced that the president would soon sign a decree confirming 2015 as Jubilee Year. A blueprint for the commemoration was put together and presented to the government for approval, including provision for a budget of 31 billion roubles (£404m) of which 19 billion was to come from central government and the remaining 12 billion from commercial sources. The project was to involve the construction of dozens of public amenities and a complete overhaul of municipal services, paid for out of central funds. Two-and-a half long years were to pass, however, before the project received presidential approval, and by then the president was no longer Dmitry Medvedev but Vladimir Putin, and the celebration, it turned out, was to mark the 2000th anniversary of Derbent, not the 5000th. The city had suddenly lost 3000 years of its history, uncovered during numerous excavations in 1970-1990 by the renowned archaeologist Aleksandr Kudryavtsev. Officials and scholars argued the question for two years, and in the end a compromise was reached: human settlement on the site had begun 5000 years ago, but the town itself was a mere 2000 years old. The celebration would mark the 2000th anniversary of Derbent – the city had suddenly lost 3000 years of its history. A committee was set up to oversee the preparations for the celebration, and in May 2013 Ramazan Abdulatipov, the acting Head of the Republic of Dagestan, announced that a new agreement had been reached on a central government grant of 8 billion roubles, and that the republic would try to find additional funding. But government confirmation of the various elements of the project and its budget came a full nine months after its presidential approval, in violation of a number of legal deadlines. At this stage the promised central funding had been reduced to only 1.255 billion roubles, with the government of Dagestan and the city administration contributing another 700m. The appropriate directives were issued and the initial funding tranches calculated, but another year went by without any significant preparations taking place. It was only in July 2014 that Sergei Melikov, Putin’s special envoy to the North Caucasus Federal District, of which Dagestan is a part, took the initiative to set up a working group to plan the celebrations; and real preparations began the following month, exactly four years after the event had been announced. Since then, the city has been bogged down in endless meetings at various levels, and a catalogue of broken promises. Some months there have been a dozen meetings, with speakers, such as the head of the republic, Abdulatipov and First Minister Abdusamad Gamidov, being the very people who had earlier blocked any attempt at planning the anniversary; and mayor Yaraliyev disclaiming any responsibility for its preparation and funding. Abdulatipov in fact only discovered that he was chair of the republican organising committee two years after he had been appointed. His main contribution to the discussions was to lobby for the city’s Sovetskaya (Soviet) Street to be renamed after Heydar Aliyev, the former president of neighbouring Azerbaijan; according to Abdulatipov this should ensure several billion roubles worth of Azeri investment in Derbent. View of modern Derbent. (c) Marat Biygishev. All the trees in Derbent’s largest park were uprooted in preparation for the construction of an Olympic complex. So in March-April 2014 all the trees in Derbent’s largest park were uprooted and a foundation pit dug, in preparation for the construction of an Olympic complex (to be paid for with Azeri money). Meanwhile, First Minister Gamidov visited Azerbaijan, hoping he would get the money. It turned out, however, that the park was part of a conservation area and all building was forbidden. And the Azeri money didn’t materialise either. The Azeri media has recently been full of reports that the long-allocated first funding tranche of 30m manat (30m euro at the then exchange rate) never arrived in Derbent. The result: Sovetskaya Street has not been renamed, the Olympic complex remains unbuilt, and for the last six months there has been no mention of either them or the Azeri ‘investment’ from Abdulatipov and Gamidov. The city is undergoing some improvement: 13 streets are being re-laid (widened, given pavements, asphalted, and with telecoms cables running underneath), and five parks refurbished; the 1.2m rouble costs will be shared 50:50 between the federal and republican budgets. The Naryn-Kala citadel and the city walls are being restored, with the 600m rouble cost met by the Russian Ministry of Culture. Thanks to the efforts of presidential envoy Sergei Melikov, the city’s old polyclinic building is also being refurbished and an attempt made to complete the building of the city’s Secondary School No.15, which has been under construction for seven years. Another long-term building project is also nearing completion – the Azeri Folk Theatre, funded by the Azerbaijan Ministry of Culture (ethnic Azeris make up almost one third of the city’s population [2002 Census fig.]). The construction of a new drinking water pipeline has also been included in the anniversary project: at present Derbent’s residents have running water only for a limited period three times a day. 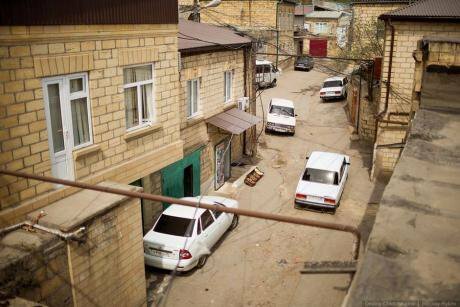 Derbent’s residents have running water only for a limited period three times a day. So far, three streets have been completed and the restoration works on the citadel and walls is also almost finished. This aspect of the project has aroused a deal of controversy and accusations of irregularities around the ‘modernisation’ of the old lower town and the upper Moghul area, as well as the use of ordinary sawn stone in the restoration work. But a Russian Ministry of Culture commission and UNESCO representatives in Russia didn’t find any serious contraventions, and we have been assured that the new stone will be artificially weathered to blend into the ancient walls. Other parts of the project are behind schedule, although they too will supposedly be finished by August. But given the lack of funds for the work and the schedule delays, the Russian government has decided to extend the project until 2018. The anniversary will now be celebrated in stages between 2015 and 2017, at republic, regional and national levels – a three-year party! Is the city, then, ready for its anniversary celebrations? Basically, no. After the project was launched, it had to wait a year and a half for any money to arrive. The promises made and the consequent expectations of the public were so grandiose that disappointment was inevitable, and the celebrations are unlikely to satisfy anyone. 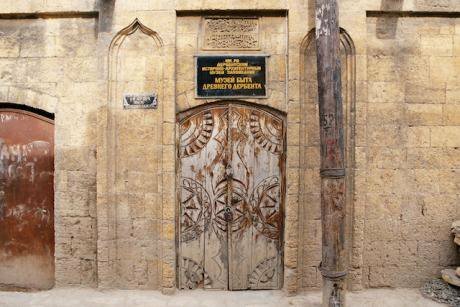 Derbent is sorely in need of large-scale rebuilding, but lacks the funds to do it. And the city has not yet recovered from two catastrophic floods in the last few years. Yet why do we need an anniversary to get anything done? Road construction, infrastructure, and housing standards are all the normal responsibility of the city council. Moreover, there is a danger that after the hasty and slapdash restoration work, the Naryn-Kala citadel and the old town will lose their authenticity and turn into replicas of themselves. Entrance to Derbent's Museum of Ancient History. Dozens of old buildings have been demolished in the last few years, replaced with shopping centres and tower blocks. Local people also complain that the anniversary project doesn’t include any repairs to the upper, Moghul part of the city, which also forms part of the UNESCO World Heritage Site. ‘There has never been any maintenance work carried out here’, says Vadif Mirzoyev, a resident of the district. ‘Our streets are filthy, with broken pavements and endless problems with our water supply. There is sewage running along the gutters and dirt, dust and rubbish everywhere. And look, we have tourists all year round. But the whole Caspian shore has been sold off and built up, although it’s all government property, and you can’t bathe there – and still they talk about developing tourism. This anniversary year is also being marked by a bitter local struggle for power. The mayor is facing two criminal charges, and the police are conducting endless searches of innumerable municipal sub-departments. In February, Dagestan’s former Minister of Justice, Azadi Ragimov, was sent from the capital Mahachkala as acting mayor, so now the city is headed by two former lawyers (Mayor Yaraliyev was the republic’s Prosecutor General from 1995 to 2006) who know next to nothing about economics, finance, construction or municipal services. This keen fight for power may well have something to do with the extended preparations for the anniversary celebrations, and the increased financial grants from central government that will come with them. Derbent has spent 5000 years at the crossroads of civilisations, and has suffered countless wars. But it has survived and preserved its ancient monuments and walls: not a single invader even considered destroying its fabric – on the contrary, each new ruler added to its strength and beauty. But will the ancient city survive the onslaught of its latest rulers, the bureaucrats?